Nine parts in one volume (27.5 cm), I (13-14 December 1956):  pp., text illustrations. Lots numbered 1-280. Errata sheet loosely inserted. 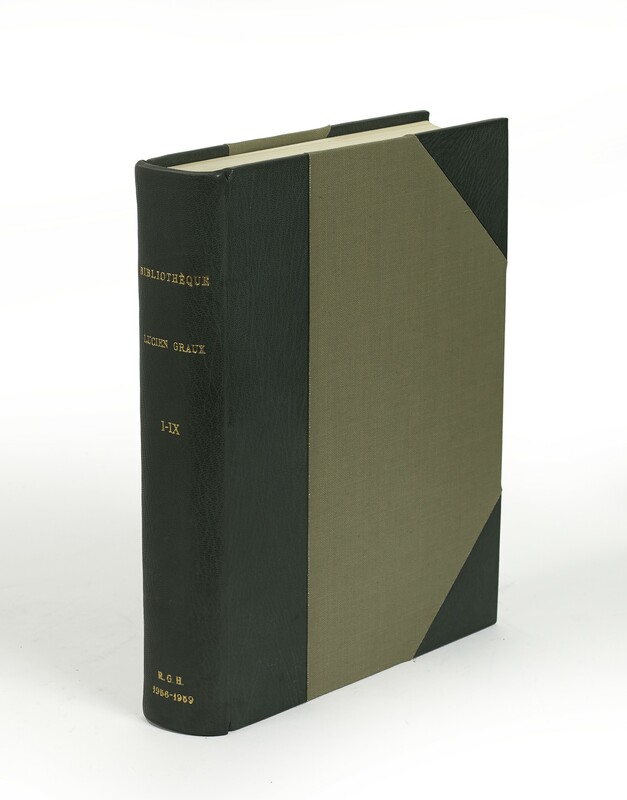 II (26 January 1957):  pp., colour frontispiece, 9 plates,  leaves (facsimile accompanying lot 74), text illustrations. Lots numbered 1-132. Errata sheet loosely inserted. III (20-21 March 1957):  pp., text illustrations. Lots numbered 1-285. IV (4 June 1957):  pp., frontispiece, 7 plates, text illustrations. Lots numbered 1-137. V (12-13 December 1957):  pp., text illustrations. Lots numbered 1-284. VI (20-21 March 1958):  pp. Lots numbered 1-311. VII (18 June 1958):  pp., text illustrations. Lots numbered 1-188. VIII (11-12 December 1958):  pp. Lots numbered 1-380. IX (26 June 1959):  pp. Lots numbered 1-344. Morocco-backed boards, a collector’s binding (original wrappers bound in). 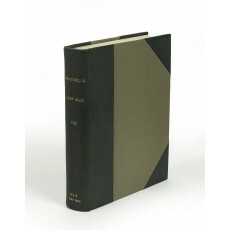 - Rare complete set of sale catalogues of Lucien Graux’s library. 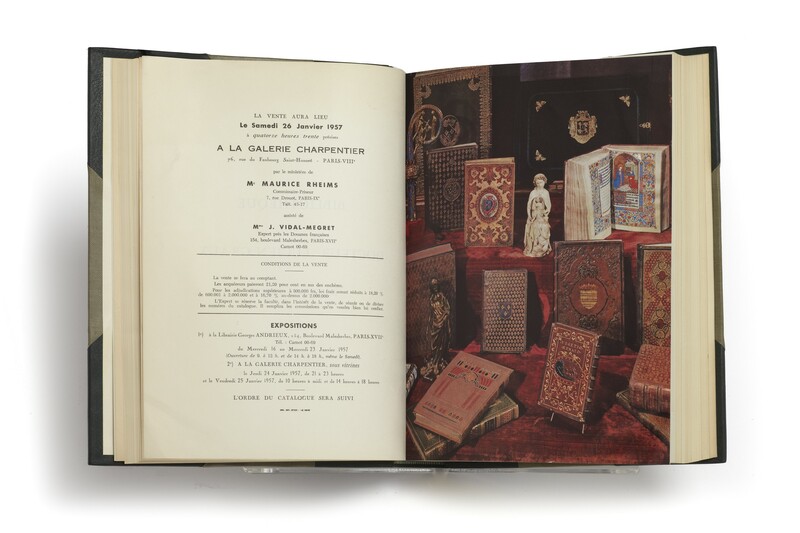 Lucien Graux was majority stockholder in a firm manufacturing one of France’s most popular proprietary medicines and thus had the means to amass an important collection of autographs, manuscripts, and printed books. He was deported to Germany in the latter part of the War and died at Dachau on 10 October 1944. Lucien Graux’s chief interests as a collector were French 19th and 20th century literature and historical autographs; however, the sale on 26 January 1957 includes a number of interesting bindings, some from the Whitney Hoff and Rahir sales. H. Colas, “La Bibliothèque du docteur Lucien Graux” in Le Bibliophile, volume 3 (1933), pp.229-244. Blogie II, 362-366, 368. ¶ Fine copy.